Show us the picture of the one you like. It could save a lot of time if someone helps you search for a plan. Here is a photo of one my wife likes. I could probably figure out how to do this without plans but I would like plans to get proportions of the different pieces. Especially the top with the corbels and the door frames. -- Brian, Olathe KS --- Remember you're only one oops away from expensive firewood. Buy the mirrors first! … all else depends on their dimensions. I buy my glass from a custom shop. He can make any dimension, dual or single pane, you name it. He also does mirrors and bevels. I’m sure most cities have such a business, if not, you can order online. Buying the glass first and building a cabinet around it is backwards. Good point. You can order custom cut beveled mirrors to fit your needs. So you want to pay full bore for custom work instead of a stock blank? Glasswork isn’t as precise as woodwork typically 1/4”. You’ll get better results with glass in hand than without. Get the glass, get the actual dims and build to fit. 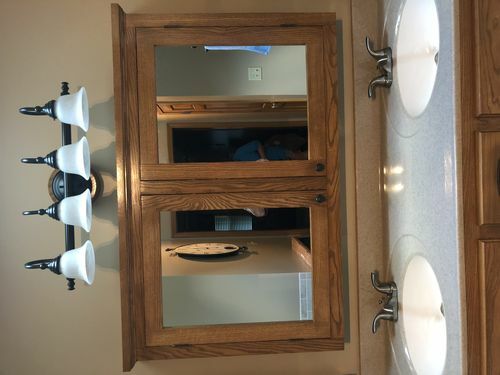 You can then drop in the mirrors at the end of the project and be done instead of taking your final dims and waiting a week for mirrors that might fit. Yeah this is backwards but better. I would build what I want with the measurements and proportions I want then order glass to fit. I would not let a stock blank (if there is such a thing) dictate the size of my cabinet. So you want to pay full bore for custom work instead of a stock blank? Glasswork isn t as precise as woodwork typically 1/4”. You ll get better results with glass in hand than without. Get the glass, get the actual dims and build to fit. 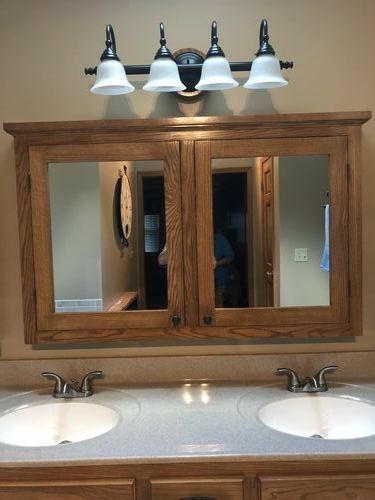 You can then drop in the mirrors at the end of the project and be done instead of taking your final dims and waiting a week for mirrors that might fit. Yeah this is backwards but better. You need to work with better suppliers. My guy gets it exact and his prices are excellent. If he didn’t, I’d find someone who did. An exception might be if you had panels in hand that you wanted to use, then there’d be no other option. Anyway back to the OP, this would be pretty easy to make your own plan. Its a nutshell it a box with a face frame, inset doors and and a little ginger bread. For proportions ? Depends, the depth of the cabinet if recessed the wall cavity will pretty much dictate depth unless you want it to stand proud of the wall for some reason . Overall size I’d start with roughly the golden mean and see where that gets you. Style and rails you can make mock ups out of cardboard until you get what you want. You could easily mock-up the whole front with cardboard. If its surface mount it can be anything you like but I wouldn’t make it to deep. Figure out what you want to put in it and go from there. 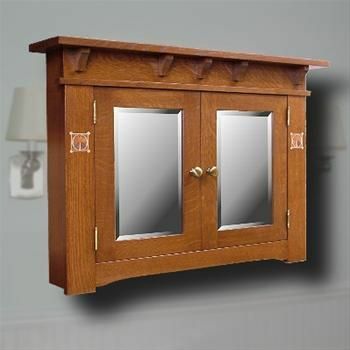 Unless you live out in a remote place there are plenty of medicine cabinets store to look at for sizes and depth. It could be a good learning process for you. I already have mirrors and I have a medicine cabinet I’m replacing. So I can get depth, height and width. Because it’s on an exterior wall it can’t be recessed. I can figure out everything on my own but it is easier with plans. The only things I’m not sure about I guess is the piece above the doors and how wide the top is. Does the piece above the door just sit in a notch in each side? This is only my fourth large project since I was out of high school, which was longer ago than I can remember, so I just feel better if I have plans. Even if I don’t make it the exact size of the plans. I will try to figure this out and I will end up with a nice medicine cabinet or expensive firewood. I’m assuming the top is 3/4 stock so I can figure out some dimensions based on that. I already have mirrors and I have a medicine cabinet I m replacing. So I can get depth, height and width. Because it s on an exterior wall it can t be recessed. I can figure out everything on my own but it is easier with plans. The only things I m not sure about I guess is the piece above the doors and how wide the top is. Does the piece above the door just sit in a notch in each side? This is only my fourth large project since I was out of high school, which was longer ago than I can remember, so I just feel better if I have plans. Even if I don t make it the exact size of the plans. I will try to figure this out and I will end up with a nice medicine cabinet or expensive firewood. I m assuming the top is 3/4 stock so I can figure out some dimensions based on that. All the information would have been very helpful had it been it your first post. Basically what you have is a 5 sided box with front + moldings. So everything you see in front is separate from the box behind it. Top and corbels are added last. After a year I have finally finished the medicine cabinet. I bought some hinges locally not thinking about the weight of the door with a mirror (beginner’s mistake or not thinking ahead or both). When I hung the door I couldn’t get it to hang with the same reveal all the way around the door. Then I realized the pin in the top hinge had bent from the weight. Does anyone know where I can order hinges that will hold the weight. The doors are oak with about a 2” frame and about 23” x 27” with a mirror about 21” x 25”. Not extremely heavy but more than cheap hinges can hold. Brian – can you share some photos of your project ? You have a real fixation with photos…lol Sometimes they are essential, but most of the time they are unnecessary. Like now. I got that link from a fellow LJ. I wish I could remember who so I could give him credit, but I don’t recall. Edit: I found it. It was a review by Jerry. yes Rich – I really like to see the craftsmanship of others. essential or not, I like them. and then they go and make it from scratch. very rarely do they make a “project post” to keep track of the build or to share it. so a photo or two here would be nice to see. I think it’s pushy. If someone wants to post a photo, they will. Your way makes it seem like an obligation. I build many more projects than I post. Some I don’t because, hey, it’s another box. Yawn. My other work that I never post are commissioned pieces. In my book, those items belong to the buyer, not me. John Smith and Rich give me a couple of weeks to get some hinges and install them and I will post a picture or two. I appreciate the help I have received here. I do this as a hobby so I don’t get to work as mush as I would like. My shop is my garage. It’s not heated so I don’t get to work in the winter here in Kansas. Throwing out a idea here, what about piano hinges? I have used them with great success on heavy doors and they don’t seem to have sagged. Throwing out a idea here, what about piano hinges? I have used them with great success on heavy doors and they don t seem to have sagged. Now that’s a Good Idea. I’ve done it myself on some Cabinets. There is a place here in the Kansas City area called Locks and Pulls. I have purchased hinges and pulls there before and that is where I bought the hinges I was having problems with. I went there yesterday and told them what I was doing and my problem. They found some hinges that will work. They do have to be mortised. Which is okay I was just going the easy route without mortising. They had to order them so it will be a week or two before they get the hinges. I am learning more about hinges than I ever thought there was to know. All hinges were not created equal. The piano hinge is a good option. I know those will hold a lot of weight. Ok finally finished and hung. Here is a picture. It’s not hanging crooked it’s the picture. Not sure why it flipped the picture. Brian that turned out really nice. However I think you cut a few corners or should I say bevels? Nonetheless yours is a really excellent project, something “Stick in the Mud” has been badgering me to build.